Club La Santa was a little piece of heaven on earth. And as such Jess Glynne’s Rather Be became my happy little earworm of the week. And now, thrown straight back into work and training with no time to reflect and blog, I’m left with a distant memory and a fading tan. But I still have my medal hanging on my wall, so it wasn’t just a really, really good dream. Just a few hours after waking up in Bristol, I was walking off the plane in Lanzarote, warm and sunny, and a short while after – I was lying on the sun lounger by the bright blue pool over looking the lagoon and arid landscape of La Santa and beyond, onto the rolling lava fields intersected with smooth tarmac that I was to be cycling on at the Volcano Triathlon, held on Lanzarote every year since 1985. 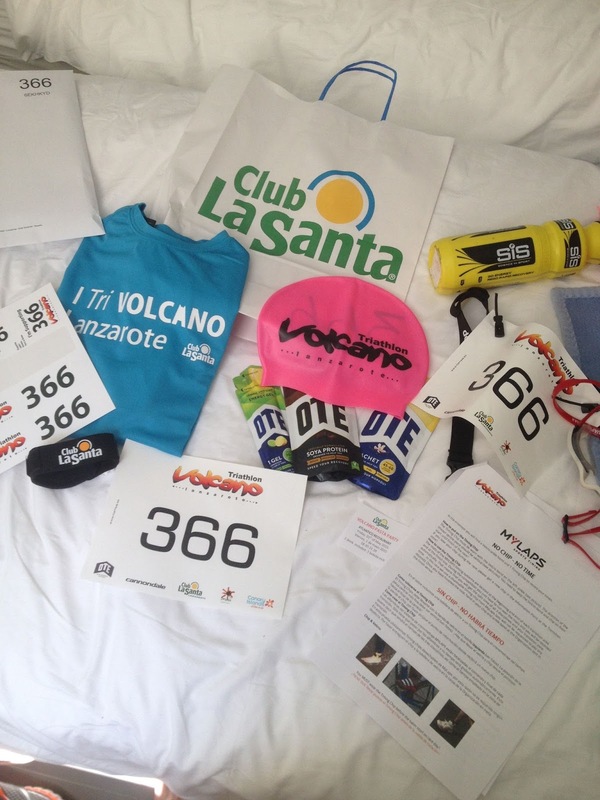 The Volcano Triathlon is therefore apparently one of the oldest triathlons around. I knew absolutely nothing about this race when I booked it, it just happened that the race coincided with my trip to Club La Santa with my running club, and also conveniently fell on the exact weekend that a Mr Don Fink said that I should be doing an Olympic Triathlon for my Ironman training. 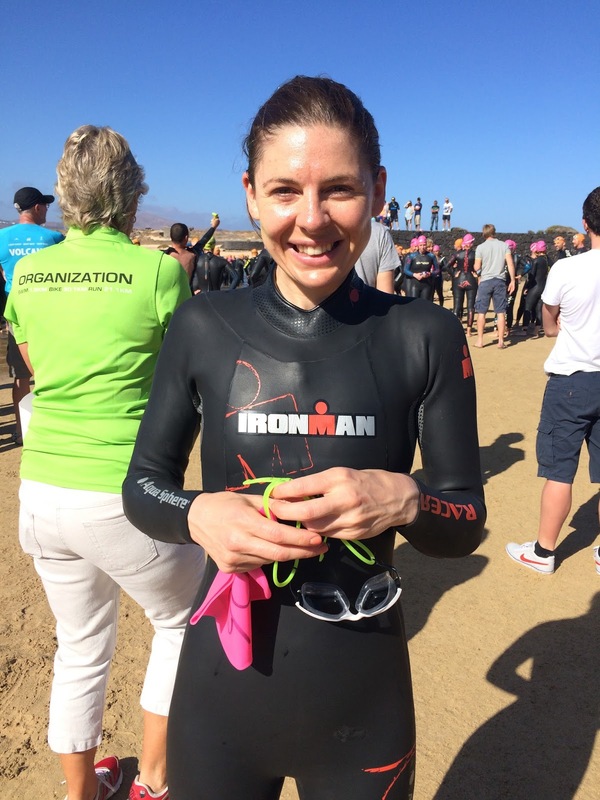 It was booked without a second thought many months ago, best £50 I’ve spent and was to be my very first triathlon of my Ironman season and of 2015. I was pleased that the race was on the Saturday after arriving on Thursday, giving me a day to acclimatise and also have it out of the way so I could just chill for a few days thereafter and not feel apprehensive. The night before the race, the butterflies appeared and said hello to me. I’m used to doing races now, so I don’t really think much of them. I just book events and then let them roll around, but the butterflies always come. The day before the race we had to head over to pick up our race packs, which I did with excitement and was in fact second in the queue with a grin on my face. Once collected, I lay out my transition and everything that I needed for the race on the floor of my apartment. 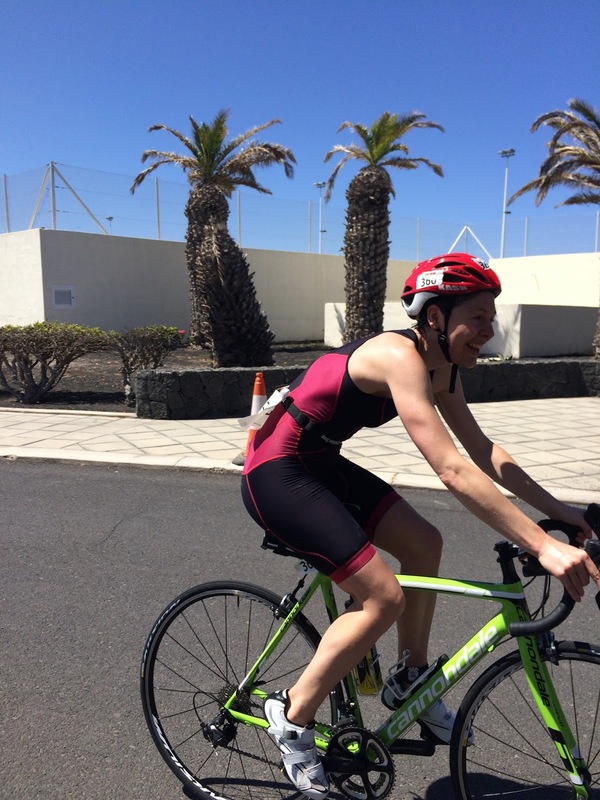 And proceeded to cycle 20 miles as a warm up after completing a test lap of the 1.5km swim route in the lagoon. The day of the race was beautifully sunny and warm, with a cool breeze. Perfect conditions. I woke up early and headed over the road, just a few metres away, to rack up my SuperSix Evo – a lime green carbon beauty that I’d borrowed for the week. I racked up my bike, went through the usual routine of opening my energy bars ready for grabbing and scoffing with ease (later to be vomited up on the bike, nothing new for the bike section of a tri after swallowing lake water), two bottles of Osmo active hydration plus a bottle to swig in transition before the run, pulled on my wetsuit, and headed down to the lake. 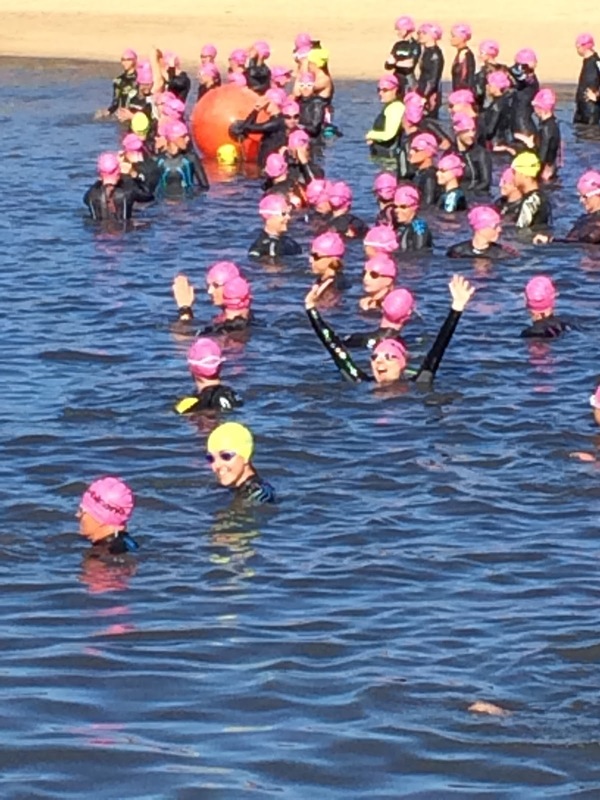 I was a little apprehensive about the swim as it was my first open water since last summer, and I had a little bit of a panic after heading off – a couple of knocks and difficulty finding my own spot in which to swim, like being in a traffic jam of swimmers – odd when your stroke just lands on someones back – but I focused on breathing, telling myself to stay positive, and sooner rather than later, my breathing eased into a calm rhythm and I was well on my way to weaving myself around the buoys and headed towards transition area, at just 0:27:45 after starting, which was good as sub 30 was my goal for the 1.5km swim. The bike was hot and I kept pouring Osmo over my head as well as swigging it on a regular basis. It must have worked by osmosis (unintended coincidental joke) because I felt hydrated and fresh throughout. There was plenty of climbing on the way out, and the road back and downhill looked so appealing to me as I chomped my way through gooey energy bars up to the 20km turning point. Unfortunately, half way around the roundabout on said turning point, the strong wind said HELLO!!! 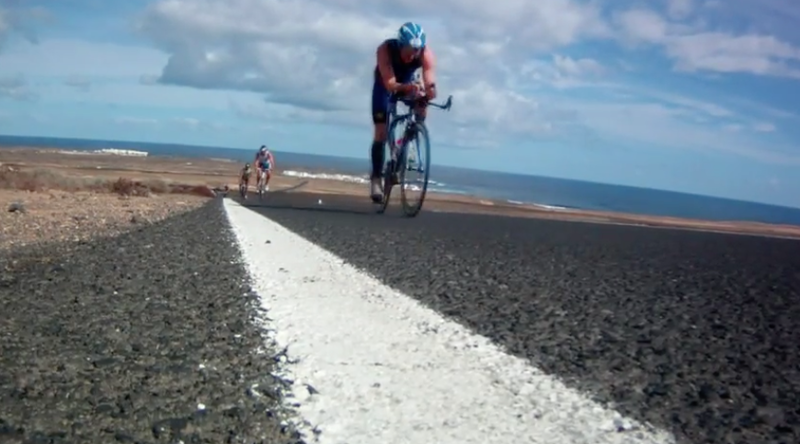 and the nice looking downhill actually turned out to be a pedal pushing wall of wind all the way back to Club La Santa. 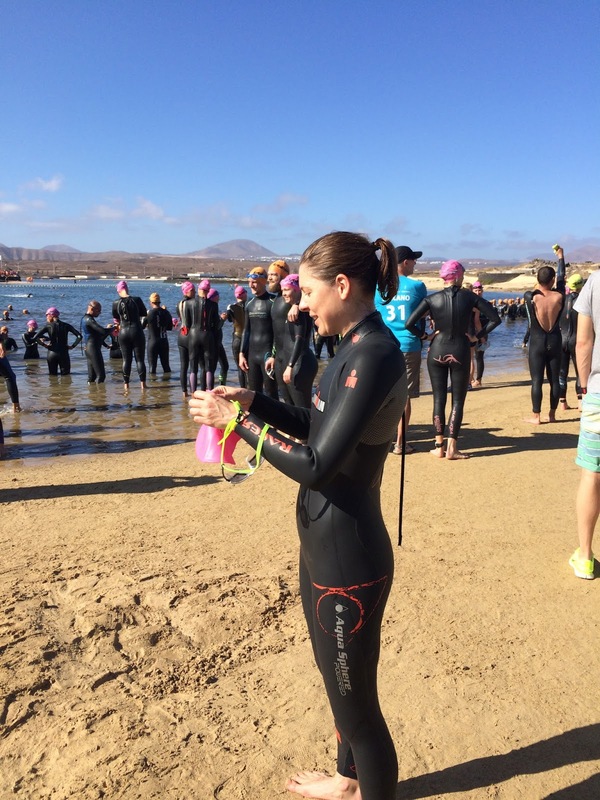 I passed lots of people along the way, which was satisfying, and had a chat with a lovely girl wearing a lot of pink called Holly, who had qualified for Kona! So we had a quick chat, and then proceeded to play cat and mouse for a while on the bike course. 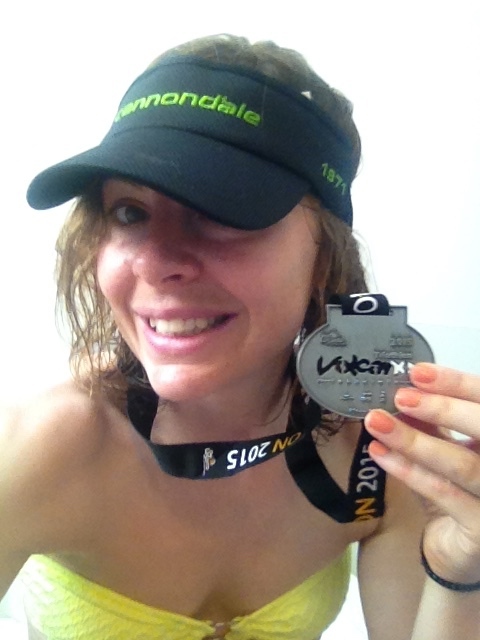 Final stint in transition, swig of Osmo, munch on a protein bar and off I went to … oh wait. My shoe is stuck on. Hooray! 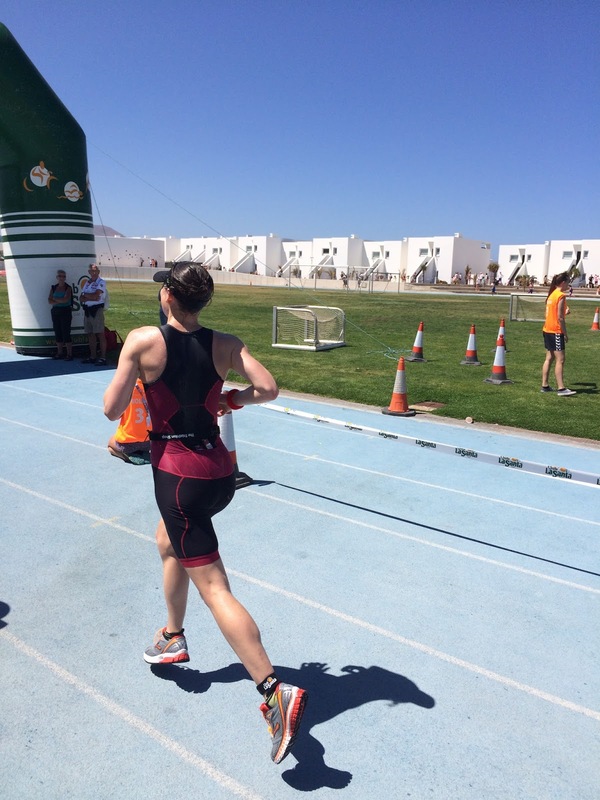 My previous and very first triathlon season had been blighted by plantar fasciitis, and after a few months of the condition fading away and then coming back to say hi like some monster in a scary film, I’d had over four months of pain free running. Thus far from kick-off of Ironman training in January, I had been able to fulfil my running plans entirely, and aside from a little hiccup after a maiden stint on a running track a few weeks ago, entirely pain free and has lead a return to almost pre-injury running fitness. Long story short – I could run. My legs felt fresh. I felt fresh. I felt GREAT! I pushed it relatively hard, and passed a fair few people on the run. I poured water over my head at every opportunity, partly to cool me down and partly because I’d seen the pro’s do it on youtube. And then, I finished. With a great big smile on my face. My first race abroad, smiles everywhere, amazing weather, amazing support, amazing organisation, and a great medal to boot. Post raced analysis? I loved it! And I’ll be back. 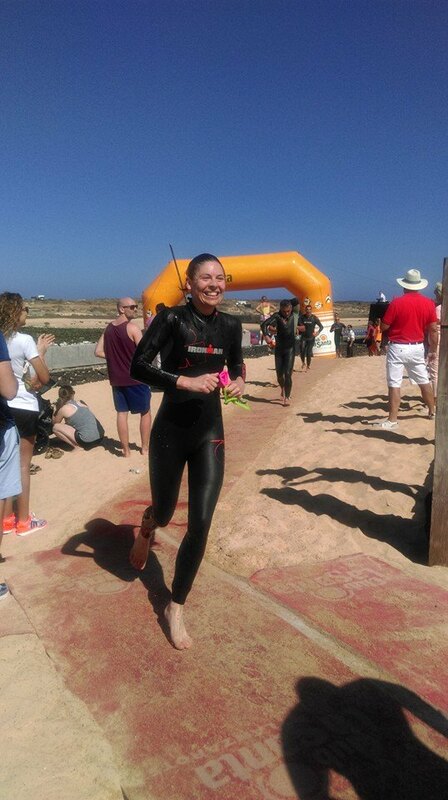 Pony-tailed race founder Kenneth was all smiles at the finish line, and was pleased to hear that I had in fact enjoyed my first ever race in Lanza.